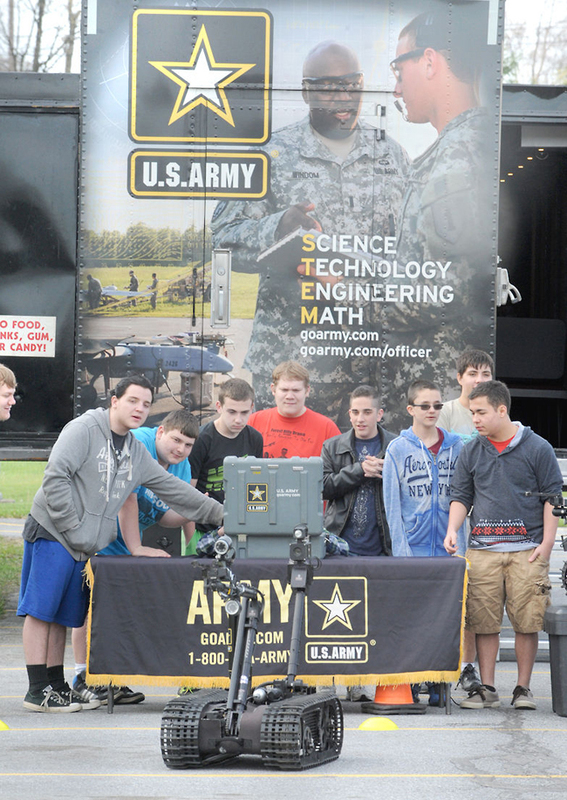 Using robots, military vehicles and a semi tractor trailer filled with displays, the Army and Army Reserve Recruiting Center of Johnstown showed students some of the ways Science, Technology, Engineering and Mathematics programs can lead to challenging and enjoyable careers on Monday. About 400 high schoolers attended the event held at Greater Johnstown Career and Technology Center in Richland Township. The event was presented by the Army, PA CareerLink Cambria County, Goodwill of the Southern Alleghenies, Greater Johnstown Career and Technology Center, and the Workforce Innovation and Opportunity Act Youth Staff. Representatives from several local technology-based companies also participated. “What was great was seeing them interact with the businesses, with the Army gentlemen,” Nancy Peck, a senior project manager at Goodwill said. The recruitment center plans to hold similar events at Admiral Peary Area Vocational Technical School on Tuesday, Westmont Hilltop High School on Wednesday, and Greater Johnstown High School on Thursday.